This week’s shop update features new takes on old items. Bows and tassels - can you tell I love them?! 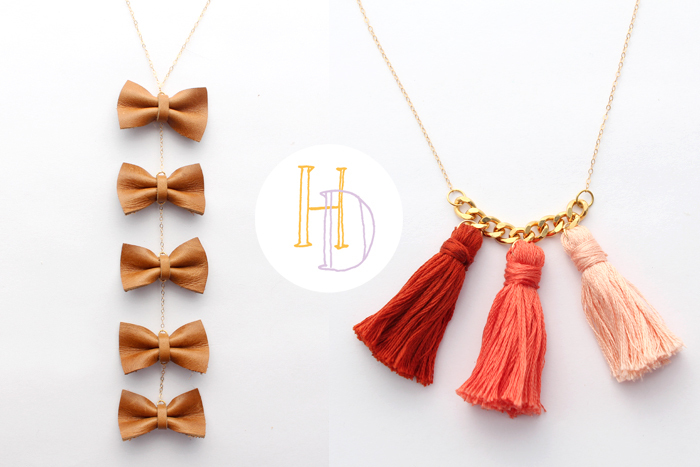 Bow In A Row - This is a fun little play on my signature bow necklace. Still made out of leather, I’ve shrunk the bows down to itty bitty miniature size. 5 of these mini bows dangle from small gold chain. Too cute. Fringe - Switching it up from my usual leather tassels, Fringe necklaces are made from colored floss. These ones are trio tassels, and I’ve tried to keep them in cool ombre color palletes. But I’ll have single Fringe necklaces soon, too! Stay tuned for more shop updates to come! P.S - don’t forget that you can access the shop straight from the blog here at any time! Either click on the widget over on the left sidebar, or go through the shop page from the left banner menu.